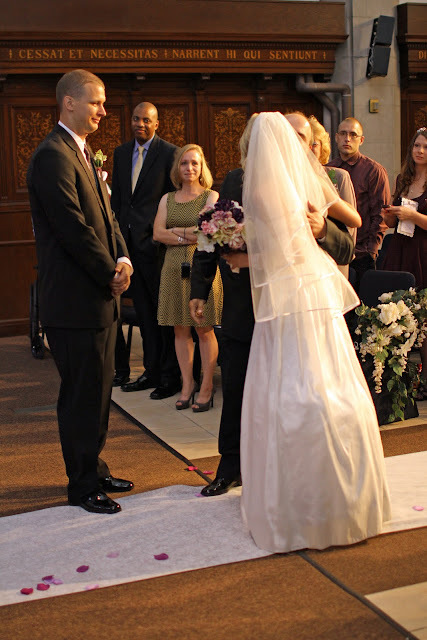 lynette marie: His & Her Perspective: Our Wedding Day pt. 2! His & Her Perspective: Our Wedding Day pt. 2! Our ceremony was set to begin at 3:00, and I believe it started within a few moments of 3. 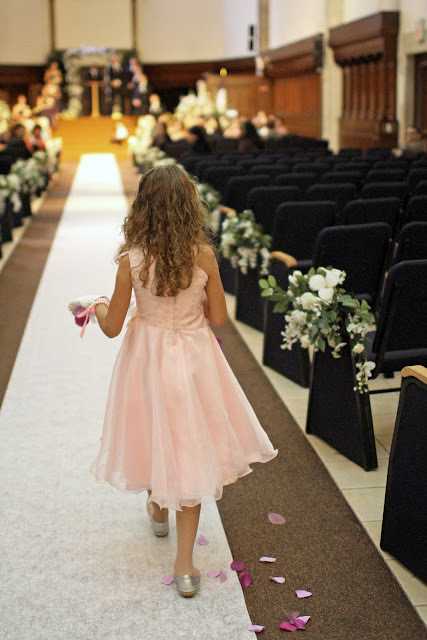 Right before the ceremony, I was in a dark little hallway by myself while my bridal party walked down the aisle so that no one looking toward the back of the church would see me. I spent those few moments alone just praying. 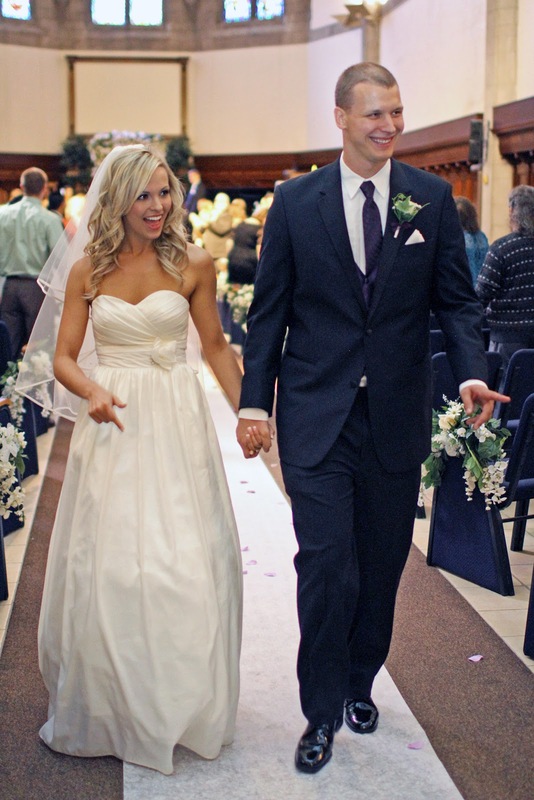 These were my last few moments being a single woman, only being "married" to Christ. The tears wanted to come, but I kept myself together and reminded myself that today was a happy day! I thanked God, and shared my heart with Him, and my commitment to this great future He had designed for me. I was ready for it! I specifically chose the songs to be played as my bridal party walked. The songs were "I'm Yours Forever" by Dara Maclean and "Love Never Fails You" by Brandon Heath. The words of these songs are so sweet! The song I chose to walk to was "Everything" by Lifehouse. Again, because the words are so sweet and so true, and it was a song that was emotional for both Matt & I. 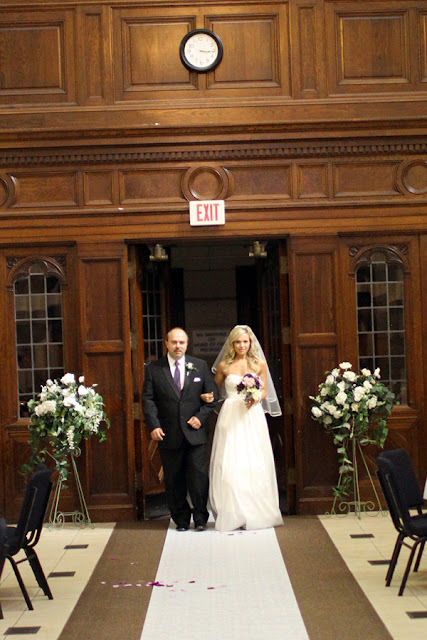 Right before I walked down the aisle, I stood in the back of the church with my dad. What an emotional moment. Again, I kept myself together. My song started, and they opened the church doors for me. Gosh, the tears are starting to flow as I write this! So many emotions were going on in that moment. Walking down the aisle was everything I'd envisioned it would be. Surreal. Beautiful. Sweet. Slow. Since my reception was actually taking place at the front of the chapel, I walked past my tables and saw how beautifully my family had set it up for me. "It looks beautiful", my dad whispered. And it did! I felt like I was floating on a cloud as I walked toward all my guests. I saw friends and family I had not seen in years. I saw my older sister, crying like a baby, and all of my bridesmaids, crying like babies. And then I looked up at my (now) husband, and saw the tears in his eyes, and suddenly I couldn't hold mine back anymore! When we got to the altar, Pastor Andre asked "Who gives this bride away?" and my dad said "I do." As Matt came down the steps of the stage to get me, my dad turned to me and hugged me and whispered, "Love you, baby." More tears! I was waiting in the front of the church and my stomach was a little upset. That is what you get for eating a Subway foot long sub and a liter of Brisk Raspberry Ice tea before your ceremony! I prayed and the feeling went away. The music started and everyone began walking down the isle. Everything went according to plan. Everyone was in their position except my bride. I had my glasses in my pocket and slipped them on so I could see all the way back to the church. The Lifehouse song started, the doors opened up, and there was my bride. Just as perfect as when I saw her an hour ago. As she walked towards me, I was so emotional and tears were just rolling down my face. She stopped with her dad at the bottom of the stairs. I gave her dad a hug and took my bride up the stairs. Our ceremony, in our opinion, was absolutely perfect. Some may have thought it was too traditional or not personal enough, but for us, it was perfect. It was completely about God, based on scripture, about our holy union before Him, and what that union meant. It was about coming together as one, and never dividing again. We said very traditional vows, but we meant them from our hearts. The ceremony was perfect! Even the part of communion, where I was handed a cracker and just bit into it, expecting to hand back the other half. Then Pastor Andre started handing us the sparkling grape juice, and I still had half a cracker in my hand and no where to put it, so I popped it in my mouth and chewed fast! Then it was over, and we were married! 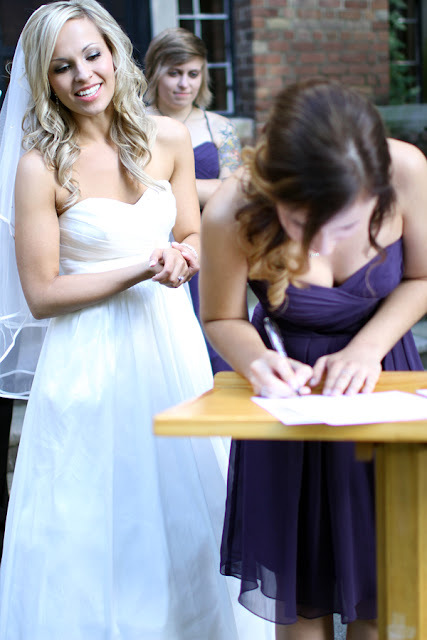 We went back into the courtyard to sign the marriage license and to take a few more family photos. 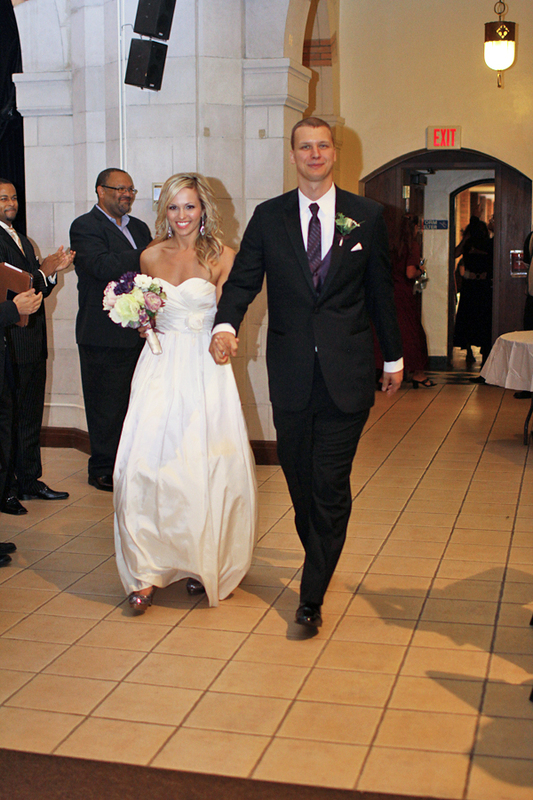 We were so grateful to have OUR Pastor be the one to marry us. Our church is so big that usually you just have someone from Pastoral Care marry you (like Matt!) but we were able to make a special request for our own Pastor, for which we are forever grateful! It made the day even more special. After this, we went back into the chapel for our reception! We walked into the reception and everyone was cheering for us. We sat down and everyone was just staring at us. Lynette said “Why is everyone starring at us?” They were waiting for us to get our plates first. John ended up getting a plate for both of us. I asked Quinn for the order of the reception. I wanted to make sure everything went according to plan. The reception was short and sweet, just how we wanted it. Matt and I made our way around to greet our 100 guests. It was so good to see family and friends, and meet a few more of Matt's family that I hadn't met yet. Jon and Jen gave toasts. Jon's was so sweet and sincere, and Jen's was so moving. Nothing will move you like your little baby twin sister making a toast at your wedding! 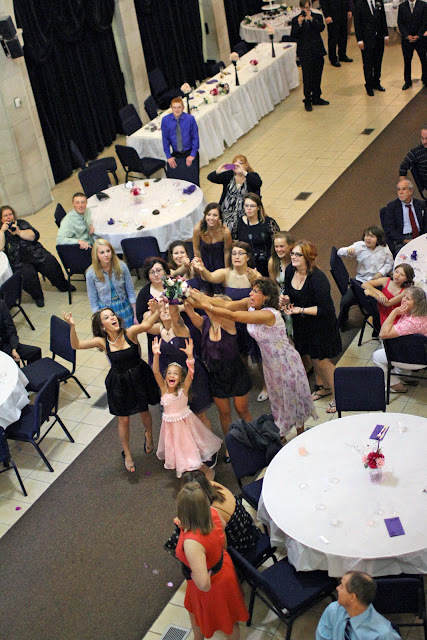 Then came the bouquet toss. 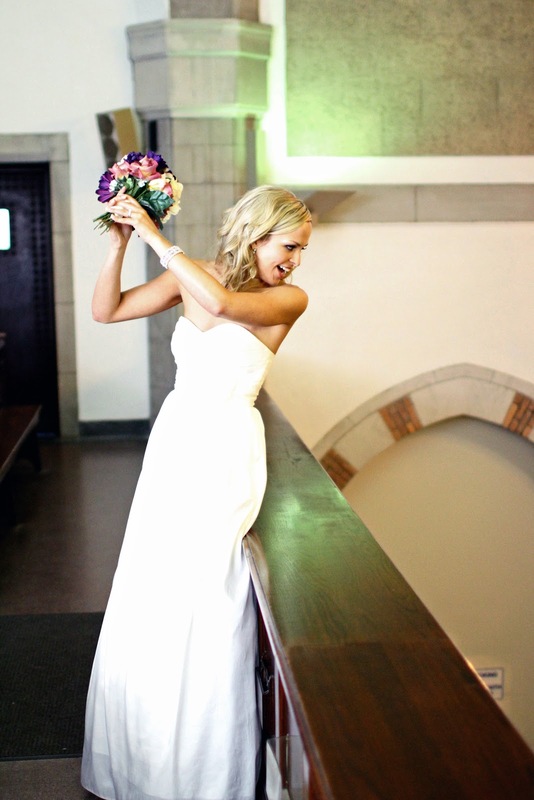 I went up into the balcony to toss the bouquet. Of course, I had to fake 'em out and pretend to toss it before actually tossing it. :) But when I did, guess who caught it? None other than my sweet little Jen! 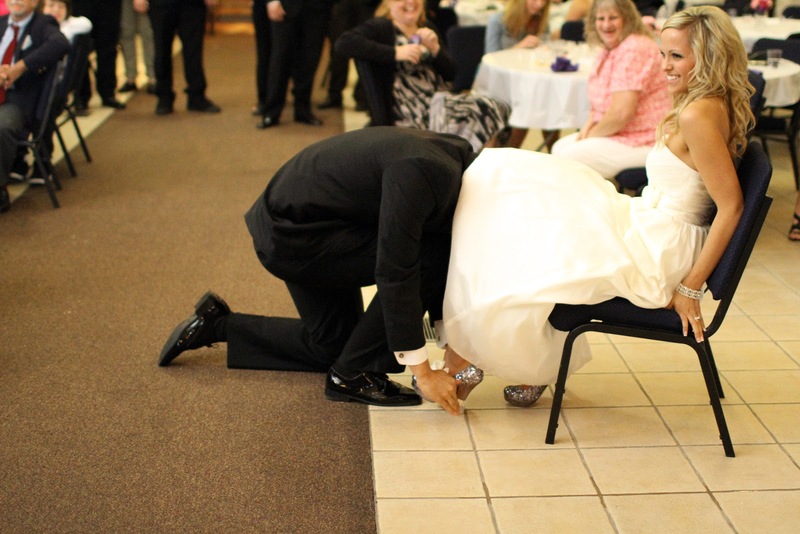 Then came the garter toss. Talk about hilariously awkward. I guess I never realized how awkward it'd be having Matt go up my dress in front of 100 people. Ha! But it was cute. He got it! And tossed it.. to our other friend from Texas, Anjolo! We'd planned on the reception going until 7, but by about 6:15, Matt and I were exhausted. Utterly exhuasted. I went from being overjoyed at being with my family and friends, to crashing and feeling like I was going to pass out in the middle of the church. I think my nerves and exhaustion were finally catching up with me! So we left early. I was up at the front of the church with some friends. I was then told that everyone was ready for us to leave. I didn’t have my cloths from the pastoral care office. I was not happy about that. Jon was right next to me. I tried to formulate a plan as I was leaving the door. I couldn’t think of anything and asked John to just organize my stuff and I will get it later. It was time to make our triumphant exit with my Disney Princess. 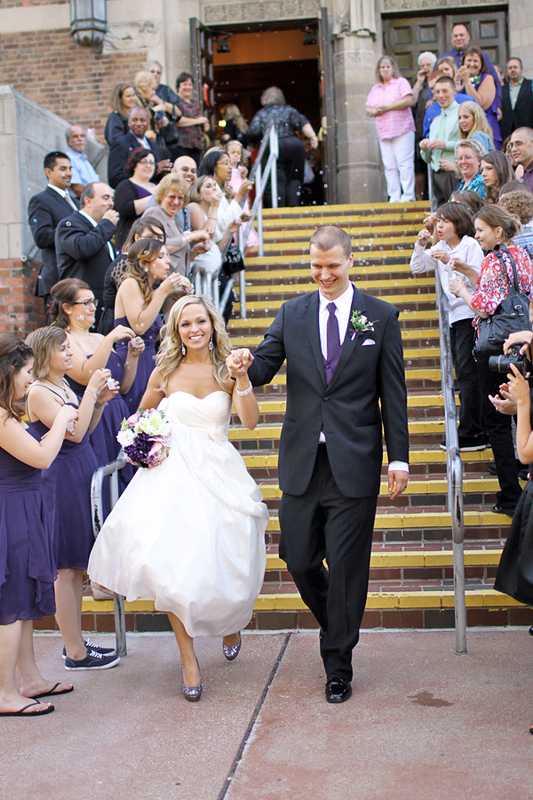 Here is us exiting the church to a sea of bubbles! What a sweet moment. It was so fun walking through the bubbles, and seeing our friends and family on either sides! Here comes another embarrassing moment though: Matt and I walked right past his car! 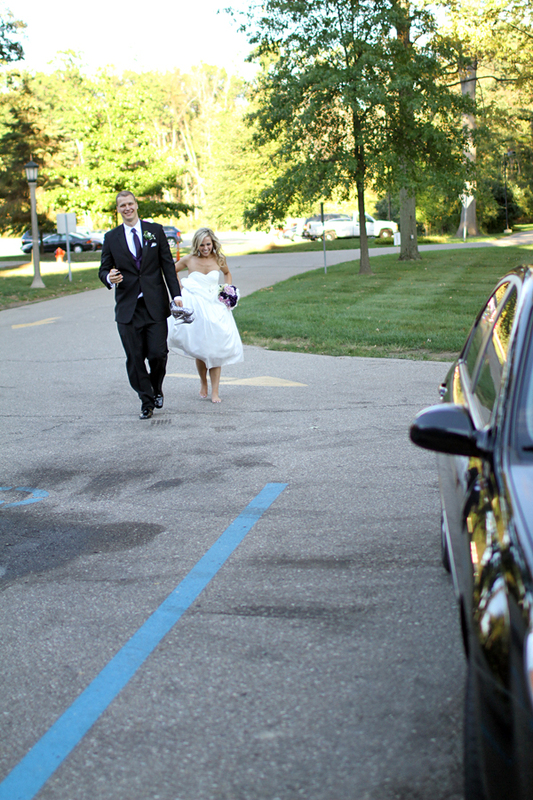 It was parked in front of the chapel, but somehow we missed it and started walking toward the parking lot! Our amused bridal party started yelling out to us, and we noticed our silly mistake, and walked the walk of shame back to our car, in front of all of our guests. HA! Too hilarious. At least we made it out! So that, my dear friends, was my wedding day! Beautiful, perfect, and flawless. Would not have changed a thing. Nothing at all. Thanks to everyone played a part in making our day special. We couldn’t have done it without you. okay i was able to pull myself together so i could read this post. you looked gorgeous and so happy! i love that you had cupcakes instead of a cake and i especially love that you played 'everything' by lifehouse (one of my favorite songs for Edward and I). If we had one comment repeated the most at our wedding, it was our guests thanking us for having cupcakes rather than cake. Wedding cake is gross to me and sooo expensive, and it was nice choosing four different flavors so that every guest could find something they liked! Birchbox vs. Ipsy (My Glam Bag) November 2012! His & Her Perspective: Our Wedding Day!